Cedar Siding is often synonymous with residential homes due its durability, versatility and appearance, along with its warm tones, alluring scent and numerous other benefits. When we think of a commercial space we often think of cement, stone, and drab colours devoid of any warmth. Commercial spaces of years long since past flocked to the ease of being able to erect towering structures easily with sturdy manmade materials, often accentuating them with carvings, statues and appealing structural design which would make any architect gasp at the ingenuity. Unfortunately, modern times have taken the magical allure from these simple concrete and stone structures and left us with the Big Box stores, much devoid of anything alluring other than the sales inside. Recently there’s been a resurgence in the architectural design of commercial spaces. With so many changes taking place within the commercial space with online markets, and the great American pastime, the Mall, having to look for new and creative ways to lure in shoppers, there’s been a great interest in businesses looking to create commercial spaces which are warm and inviting. One of the easiest ways to revamp a drab commercial space is with Cedar Siding. This low-density softwood has a host of benefits such as: anti-bacterial and anti-fungal properties, natural insect repellant, it reduces heat flow and is a natural acoustic barrier. And with minimal maintenance and upkeep, it’s easy to see why this trend has been growing. Famous architect Frank Lloyd Wright was known for his use of natural building materials, his designs often inspired by shapes in nature. His use of Cedar both inside and outside were an inspiration to residential and commercial spaces throughout his career in the early 20th Century until his death in 1959. 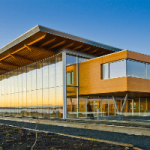 Many new commercial spaces are taking inspiration with these designs, creating commercial spaces that not only reflect the beauty and allure of Cedar Siding, but are also eco-friendly and built with sustainability in mind. A notable example of this design ingenuity is the STGM Head Office in Quebec City. Leave it to an architectural firm to design an office space with a commitment to environmental sustainability. The once cramped, generic 1980s suburban office building was completely resurrected, their use of Cedar Siding bringing life to the former service lot where it sits. But don’t think that implementing the benefits of Cedar Siding means that you’ll have to redo the entire façade. A common design technique is adding accents to your space, in this case, the use of Cedar Siding strategically placed. This purposive design is all about creating an environment which should contribute to the creating of an experience for not only the occupants, but also the customers. Columbia Sportswear in Seattle has used this technique, adding to the appeal of their outdoor brand with the use of a knotty Red Cedar Siding. Using reclaimed Cedar Siding is a great way to enhance your commercial space while also being eco-friendly. This slightly weathered siding can add a rustic charm to any business exterior, while still maintaining all the great benefits Cedar has to offer. Whole Foods has been known to add this type of Cedar Siding accents to many of its locations. And when Amazon bought the Whole Foods chain last June and used many of the locations as Amazon pick-up points for their online customers, it proved that a warm, welcoming and beautiful commercial space has no limitations.